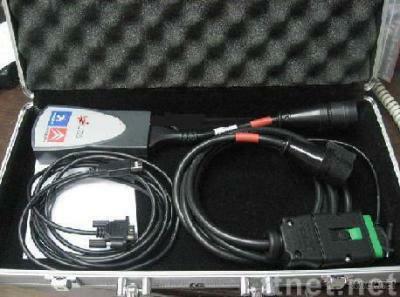 Safety/Quality Approvals: Description Dealer diagnostic scanner for comprehensive Citroen and Peugeot cars diagnostic. You can do all as a authorized dealer does.This diagnostics software allows you to perform complete diagnostics of all from 1995 untill present models. Diagnostics is performed via OBD-II connector (which is located near steering wheel) or via manufacturer-specific connector (only older cars, pre-2001). Read fault codes Displays all stored and pending fault codes with complete description (e.g. "Rail pressure - too low pressure"). Program supports report printing or copy to clipboard. Clear fault codes This function clears all stored fault codes and other diagnostic information. Auto-scan (complete car scan/test) Detects all ECUs (electronic control units) installed in car and reads all diagnostic fault codes. Measured Values Program displays live Data like Engine Speed, Battery voltage, Oxygen Sensor, Coolant Temperature, etc. Values can be displayed in graph, 9 values at once, or full listing (all measured values). Logging to file is also supported, which allows offline analysis. Patent No./Country: Programming functions/Adaptation This feature is of great importance in all vehicles because systems like Engine control units, Immobilizers, Airbags, Alarms, Body Control Units, and some others, require you to perform reset or programming procedures after car repair is done, or even configuration after replacing broken Control Unit. Hardware and software requirements Software requires at least Intel Celeron/Pentium III 400 MHz, 128 MB RAM, 50MB free HDD space and USB 1.1 port (USB 2.0 recommended) and Microsoft Windows 98 SR2/2000/XP with the latest service pack installed. If customer requires, we can prepare ready to work PC.